Taste of Baltimore: ICED TEA!!!!!!!!!!!!! This may be ridiculous, but I JUST made iced tea for the first time yesterday and now I am hooked. 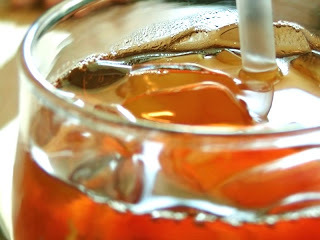 I will never ever ever buy iced tea again because it's so easy!!!!!!!!!! Anyway, I am really happy now. Does anyone make iced tea another way? Has anyone tried to make Sun Tea before?? ALSO - I KNOW YOU KNOW THIS, BUT TODAY IS THE LAST DAY TO ENTER MY GIVEAWAY FOR A $25 GIFT CERTIFICATE TO MCCORMICK AND SCHMICK'S! Just write in a comment and you'll be in the running! I'll let you know tomorrow who the lucky winner will be! Try loose green tea leaves, Golden Moon Sencha, Matcha Sencha Green Tea or something from Wegmans. They have about 10 or 20 types loose. Alexander - I love that you have a dedicated saucepan! I can't wait to start experimenting as well! I haven't tried any of the Eastern Shore Tea Company's teas, but I feel like some of the flavors would work perfectly in Iced Tea. Any recommendations? Of course it depends what you're looking for, and of course, my technique means that I can stretch out a single bag of tea as long as several years, if I have several to choose from in the house at once. http://www.easternshoretea.com/3oz.htm will show you what they have to offer; my personal "flavourites" are Gunner's Tea, Pomander Tea, Canton Spice, Ginger Pear, Marmalade, and Spiced Apricot. Again, you only need a spoonful at best of the flavoured tea, cut down with cheap tea bags (or not so cheap, if you prefer). Mind you, I've been known to boil the whole mess for ten minutes or more; I can stand the bitter tannins even in summer heat. Heck, sometimes I don't do any real straining, and leave a few leaves floating about--call it dietary fiber, if you will. Remember, the objective is a slightly watered-down tea to keep in the fridge to quaff instead of soda or water, not a fine sipping beverage. We used to add tea bags to the water as we boiled it (in a saucepan), then diluted the result with cold water. Now I find that I can make an even stronger concentrate (this using fewer tea bags) in the Mr Coffee. Alexander - thank you for the great tips!!! I definitely think I want to try something fruity soon. This is going to be so great in the summer!!!! Minx - How do you make the concentrate??? Nakia - 5-6 teabags + 1 4-cup pot of water in my Mr Coffee = 4 cups of very strong tea, aka concentrate. My family makes what we call "Summer Tea" aka "Crack" (it is so addictive!!!).... I fill my tea pot and boil, turn off heat and add six (I use plain old Lipton) tea bags and let steep for any where from an hour to over night. I use a rubbermaid drink pitcher/container 2.75 QT. I pour the tea in the container up to the two quart line (I always have less so just add water the rest of the way to the line). Then add orange juice up to the top, comes out to be 3 3/4 - 4 cups, 1-2 packets of Equal (I know I know...) depending on how sweet you want it, and a squirt of lemon juice (1-2 Tbsp). I usually make two batches because it goes so quickly, this way I always have some in the fridge, since my husband drinks it by the pint....the best! oooooh orange juice?? Your version sounds delicious!!! !